November 22, 2018. Fukuoka, Kyushu, Japan – His Holiness the Dalai Lama flew from Tokyo to Fukuoka, the most populous city on Kyushu Island in the west of Japan, yesterday. This morning, the streets were wet after overnight rain and a chill breeze blew as he drove the short distance to Tochoji Temple. The temple was originally founded in the 9th century by Kobo Daishi, popularly known as Kukai, who brought the esoteric, vajrayana teachings of Shingon to Japan. Once seated with the Chief Abbot inside the temple His Holiness recited the ‘Heart Sutra’ and Je Tsongkhapa’s ‘Prayer to be Reborn in Sukhavati – the Land of Bliss’ in Tibetan, after which the ‘Heart Sutra’ was recited again in Japanese. Prayers completed, His Holiness turned to face an audience of about 1500 people. “Today, in this famous temple,” he told them, “I feel fortunate to have the opportunity to recite the ‘Heart Sutra’ and the ‘Prayer to be Reborn in Sukhavati’ for those who suffered untimely death and those who lost their homes in the Kumamoto earthquakes and recent disastrous floods. “I had to recite this ‘Prayer to be Reborn in Sukhavati’ when I received novice ordination at the age of seven. I was very nervous, but managed to do it and whenever I recite it now, I remember that occasion. “To be reborn in a higher realm you need to have created positive karma, which is why it’s important to study, reflect and meditate on the teachings under the guidance of a qualified teacher. This prayer was composed by Je Tsongkhapa who was an outstanding scholar and practitioner. His book, ‘Essence of Eloquence’, which explores which of the Buddha’s teachings can be regarded as definitive and which are provisional, was translated into Hindi by the Indian Pandit Tripati and Geshe Yeshi Thapkay. I asked Tripati whether Tsongkhapa might have been as qualified as the scholars of Nalanda and he told me that among them he would have been more than equal, he would have been pre-eminent. “The ‘Heart Sutra’ is very profound. The Buddha first taught the Four Noble Truths. Of those, the first is the truth of suffering, which does not arise without causes or conditions. What brings us suffering is harming others; making others unhappy. 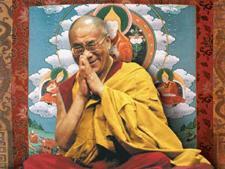 The excellent qualities of higher rebirth, on the other hand, are the result of wholesome actions. We engage in unwholesome action because of ignorance, and because our minds are unruly. Our distorted view of reality is the root of our mental afflictions, our destructive emotions, which give rise to karma, which in turn produces suffering. His Holiness invited members of the audience to ask questions and the first was about Yamaguchi a Japanese man who spent time in Tibet. He said he remembered seeing a photograph of him in Lhasa, and noted that the 13th Dalai Lama had tried to establish relations with Japan. Another questioner wanted to know what had happened when the Chinese occupied Tibet. His Holiness told him that in 1950 Tibetans fought back, but in 1951 the 17 Point Agreement about the ‘peaceful liberation of Tibet’ was signed. Historically, he observed, China and Tibet have sometimes been on friendly terms and sometimes in conflict with each other, but the Tibetan spirit has remained undaunted. His Holiness gave an extensive reply when asked how to put an end to suffering. “The first words of the first line ‘profound and peaceful’ can be interpreted as referring to the true cessation that was the focus of the first turning of the wheel of dharma. ‘Free from elaboration’ can be read as referring to what he eventually taught in the second turning of the wheel and ‘uncompounded clear light’ can refer to the third turning of the wheel. The first turning lays the foundation, the second shows that things are free from elaboration and the third reveals Buddha nature. “During the first turning of the wheel, the Buddha repeated the Four Noble Truths three times each to clarify their nature, function and result. He made clear that suffering is rooted in ignorance and this ignorance can be overcome by an undistorted view of reality. To attain the goal of true cessation he taught the true path based on an insight into emptiness that counters the ignorance of clinging to intrinsic existence. “The explanation of the Four Noble Truths, their nature, function and result provides the framework of the Buddha’s teaching. During the second turning of the wheel, he gave a deeper explanation of cessation. He explicitly taught emptiness, highlighted by Nagarjuna, and implicitly revealed how to progress on the path, as laid out in the ‘Ornament for Clear Realization’. Regarding the power of prayer, His Holiness stated that prayers for others can serve as a condition for the activation of positive karma, even if those people have committed some gravely unwholesome deed, and thus offset the potential for miserable rebirth. Water, fire, wind, herbs, and wild forests. And may they be dearer to me than myself. And all my virtues bear fruit for them. Though I have attained highest enlightenment. His Holiness counselled people in Japan not to focus exclusively on material development but to take account of the workings of the mind and emotions as well. He pointed out that we remain physically fit by observing physical hygiene and that to be mentally fit it is helpful to implement emotional hygiene by learning to tackle our destructive emotions. 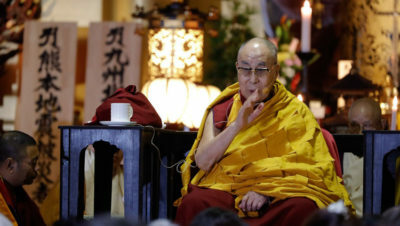 His Holiness advised those who take refuge in the Buddha to be 21st century Buddhists, to study and strengthen their faith on the basis of reason and understanding. He reported with approval how the people of the Trans-Himalayan region have pledged to make their temples, monasteries and nunneries into centres of learning, where all who wish can study and discuss what the teachings mean. He said that reciting the ‘Heart Sutra’ with an understanding of what it means would be so much more effective. After giving each other images of the Buddha, the organizer of today’s event thanked His Holiness for coming, prayed for his long life and wished that all will be well in Tibet. As His Holiness made his way out of the temple members of the public pushed gently forward hoping to see him closer to, to make contact with him or to shake his hand—he smiled and tried to please them all.